The purpose of this investigation is to develop a more advanced understanding of the germination of seeds. The investigation is worthwhile as it will explain such conditions needed for seeds to maximise germination to allow efficient plant development. This information could help the scientific community know when saline reaches dangerous levels for radish seeds. The aim of this experiment is to find out how the salinity of water affects the optimum germination of seeds. A seed is a small embryonic plant enclosed in a covering called the seed coat, usually with some stored food (“Seed”, 2016). 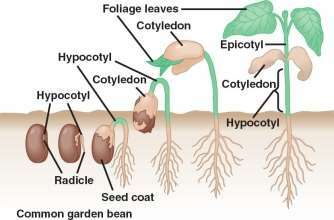 There are mainly two types of seeds: monocots and dicots. The cotyledon in monocots are just thin leaves that usually do not emerge above ground. Dicot cotyledons contain their seed’s endosperm, so they are thicker and fuller, which they use to produce more food in photosynthetic metabolism (Burchill, 2017). In dicots, the primary root first grows upward to the surface and then dives again, while the primary root in monocots grows downward. For germination to occur, the seed requires an adequate environmental temperature, light exposure and a regular intake of water (Burchill, 2017). Germination starts when the seed starts to take up water by osmosis, which is the movement of water through a permeable membrane from higher water concentration to a lower water concentration (“BBC – Standard Grade Bitesize Biology – Cells and diffusion : Revision, Page 4”, 2014). 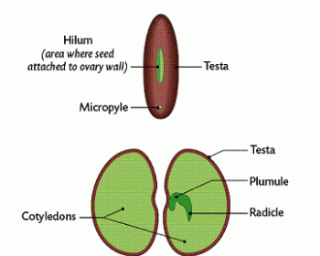 The micropyle, an opening in the testa, or seed coat, allows water to move into the seed causing it to swell and thus rupture the seed coat to allow the embryo plant to emerge (Gillam, 2014). Permeability of the testa is a major factor controlling the rate of water uptake. As seeds imbibe- absorb- water, they expand and enzymes and food supplies become hydrated. Hydrated enzymes become active and the seed increase its metabolic activities to produce energy for the growth process. In addition, the water causes turgor pressure to increase in the cells and they can enlarge. There are three stages to seed germination (“Germination of Seeds: Stages & Factors involved”, 2017). The imbibition stage, where water absorption results in rupture of seed coat. The latent stage is where the imbibition of the seed coat results in the emergence of the radicle and the plumule; and is also where the cotyledons get unfolded (“Process of Seed Germination | Tutorvista.com”, 2017). Finally, the exponential growth stage is where the cotyledons are expanded which are the true leaves. Factors such as oxygen, light, temperature, humidity and soil chemistry can all affect the germination of seeds (M. Krempels, 2017). The factor that will be studied, will be water salinity. Therefore, the independent variable in this investigation will be the salinity concentration (%) as the growth will be recorded based on different concentration, and the dependent variable will be the amount of germination (cm). 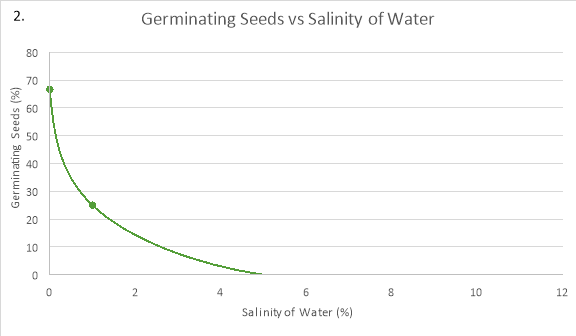 If the concentration of salinity in water (%) is increased, then the less likely/ more time it will take for the seed to germinate. 4 radish seeds were each placed into a cotton ball which were in 12 petri dishes. On the first day, 15 mL of distilled water was measured and poured in 3 petri dishes, while 1%, 5% and 10% sodium chloride solution was measured and poured each into the remaining petri dishes. However, on the other 4 days, 5 mL of each solution was measured and emptied into the corresponding petri dishes. A photo was taken each day for 5 days and observations were recorded. 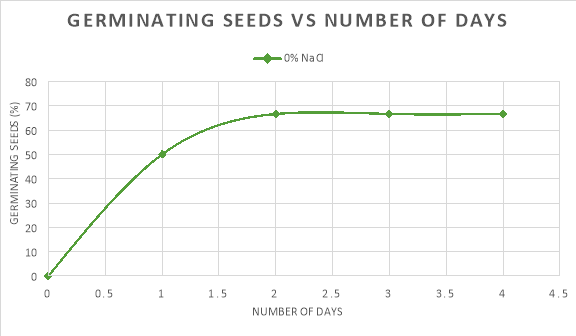 In graph 1, the pattern of the 0% NaCl trend line shows an increase in the percentage of seeds germinating in the first two days, but then slowed down and levelled off until day 4. 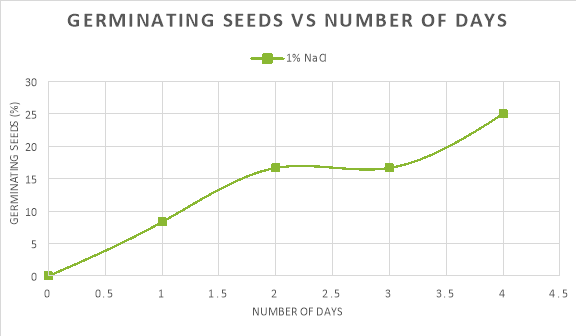 Similarly, the trendline of 1% NaCl saw an increase in the percentage of seeds germinating until day 2 where it levelled off, however after day 3 a steady increase in the amount of seeds germinating can be seen. In graph 2, the maximum amount of seeds that germinated, 66.67%, is at the optimum salinity for germination to occur in seeds, 0%. As the salinity increased from this optimum concentration, the percentage of seeds that germinated decreases. 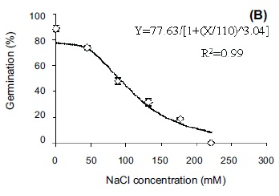 This can be seen at 1% NaCl because the percentage of seeds that germinated was 25%, and when the concentration was 5% and 10% as the amount of germinated seeds was only 0%. The seeds germinated the most when the salinity of the water was 0% because the average rate of germination in the first two days was 33.34%/day and the maximum percentage that germinated was 66.67%. As compared to: 1% NaCl, where the average rate of germination was 8.34%/day and the maximum amount of seeds that germinated was just 25%; and 5%/ 10% NaCl, where no germination took place. In conclusion, both graphs show that around 0% is the optimum concentration for radish seeds to germinate. In addition, any changes above this concentration decrease the rate of germination. 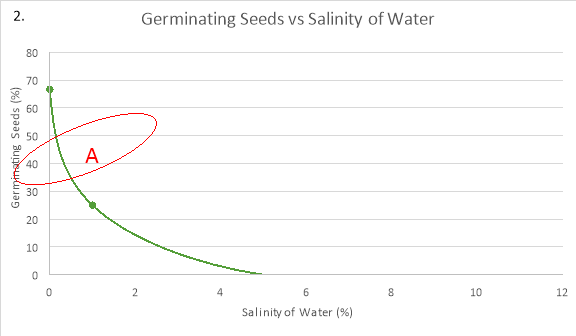 If the concentration of salinity in water (%) is increased, then the less likely/ more time it will take for the seed to germinate. It was predicted that the optimum percentage of NaCl would be 0% and there would be a steady decrease as the salinity increased. When the salinity of the water increases from 0%, the rate of germination decreased which is shown in the results as at 0% NaCl 66.67% of seeds had germinated after 4 days, at 1% NaCl 25% of seeds had germinated, and at 5% and 10% NaCl, 0% of seeds germinated. Optimal germination for most seeds has been reported in non-saline conditions (AoB Plants, 2014). The rate of imbibition decreases with increasing the concentration of a solution in the medium (Monga, 2014). Imbibition is important in seed germination as it involves the uptake of water by the dry seed, initially by osmosis. The water hydrates and activates special proteins, called enzymes, that increase its metabolic activities producing energy that begin the process of seed growth such as starch conversion into sugar (Robb, 2017). In addition, the water causes turgor pressure to increase in the cells so they can enlarge and move the radicle root down and the cotyledons up (Khon, 2017). 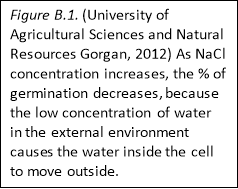 Turgor pressure is the force of water pushing the plasma membrane against the cell wall of a plant cell (eHowEducation, 2014). Although Imbibition uses aspects from the process of osmosis, imbibition and osmosis are not the same. The uptake of absorption of water by the solid substance without forming solution is called imbibition. Whereas, the movement of water molecules through a semipermeable membrane from the region of higher water concentration to the region of lesser water concentration is called osmosis (Deena T Kochunni, 2017). In the data, as the concentration increased from 0%, the rate of reaction decreased. The order of concentrations at which the rate of germination will increase from slowest to fastest is 10% NaCl, 5% NaCl, 1% NaCl and 0% NaCl. Therefore, the predicted outcome that the optimum salinity would be 0% was correct as this is what the experiment indicates, which was 0%. This is because seeds need a lower concentration of salinity in their environment, i.e. the soil, so that more water can flow into seed to get imbibed. A University of California study undertaken by Stephan Grattan, plant-water relations specialist, determined that radishes do not tolerate much salt in irrigation water (Grattan, 2002). As radish seeds are sensitive to root disturbances, the salinity of the water affected the rate of germination (“How to Grow Radishes 101 – gardenswag”, 2011). 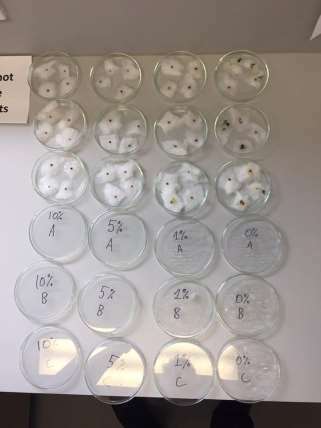 This would suggest why 25% of seeds germinated after five days in an environment containing 1% NaCl, but 0% of seeds germinating in 5% NaCl and 10% NaCl. When a seed’s environment is of the optimal concentration of NaCl, the rate of germination is at its highest and so takes a shorter amount of time. Therefore, at this optimum, the concentration gradient of water is highest which means that maximum imbibition takes place, causing the cells to swell and activate the enzymes which help break down the seed coating. This can be seen at point B on graph 2 where the radish seeds are at the optimum concentration of 0% NaCl and a maximum of 66.67% of seeds germinated. Concentrations above the optimum affect the osmotic process in seeds. Seed imbibition rate and germination percentage decrease as the surrounding water concentration decreases. 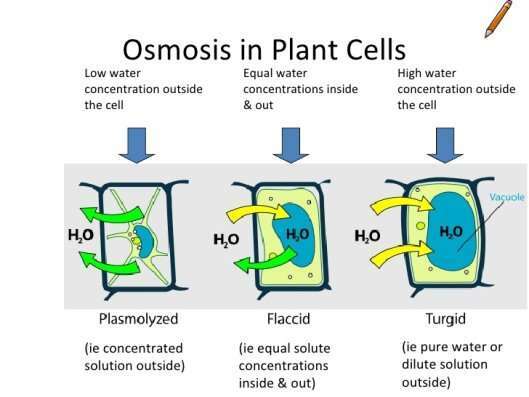 This is because, increasing the salinity decreases the concentration of water in the external environment of the seed, making the water in the seed cells travel out into the external environment, plasmolysing the cells. 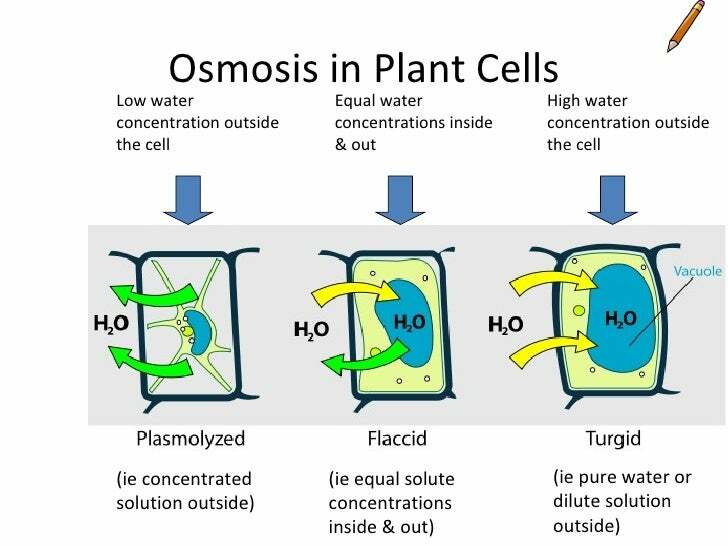 When a plant cell becomes plasmolysed, the internal cellular membrane shrivels up as the volume of water in the cytoplasm decreases, which means that there is less turgor pressure (“The Effects of Osmosis”, 2017). Therefore, it won’t germinate. This is also apparent at point B on graph 2, as there is a decrease in the percentage of germinating seeds at salinity percentages above 0%. At 0% NaCl, it is evident that the most seeds, 66.67%, had germinated by the end of day 4. This was where the concentration of water outside the seed was at its highest resulting in the most amount of water travelling into the seed at a time. In other words, the seed was in a hypotonic environment. Thus, the seeds could germinate quicker as more enzymes could become active and carry out the processes important to break the walls of the seeds. 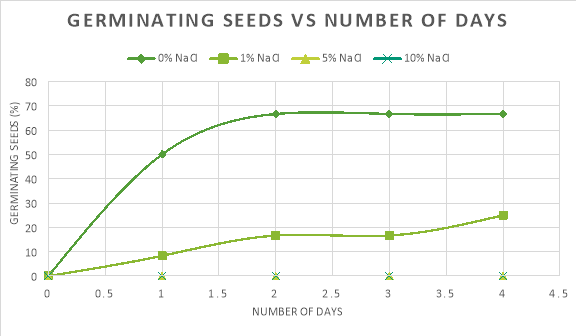 This is evident in Graph 1, as at 0% NaCl 50% of the seeds had started to germinate, which is the highest of any salinity percentage on day one. The maximum percentage of seeds germinating was 66.67%. Germination could also be seen at 1% NaCl, with 25% of the seeds germinating by the end of day four. This occurred as the water concentration on the outside was the same as the water concentration on the inside of the seed cells. Therefore, the seed was in an isotonic solution. Due to this, water was still able to come into the seed cells, however, there was less turgor pressure as the seeds’ cells were flaccid. Germination was still able to occur as some enzymes could become stimulated to aid in breaking the seed coating. This is apparent on graph 1 as on day 3 16.67% of the seeds had germinated, but at the end of day 4, 25% of the radish seeds germinated, suggesting that germination was still taking place in the other 75% of seeds. However, no obvious germination could be seen in 5% NaCl or 10% NaCl, even after the fourth day. The reason for this, is that the percentage of salinity was too much in the external environment, which means that the concentration of water in the external environment was lower than the water concentration inside the seeds’ cells- in a hypertonic environment. Consequently, more water was going out of the seeds’ cells than water was coming out, therefore the cells plasmolysed. The lack of water inside the cells could not activate enough enzymes to continue the process of germination. This is clear on graph 1 as 0% of seeds germinated throughout the 4 days. Per the results, it can be verified that as the salinity increased from 0%, the imbibition of the seed decreased causing the rate of germination to decrease. This increase in salinity caused the concentration of water outside the seed to increase, causing a hypertonic solution, which consequently made more water travel out of the cells than into, causing the cells to plasmolyse. Thus, decreasing the rate of germination. To ensure that an experiment is a fair test, only one factor can be changed at a time while keeping all other conditions the same (“Doing a Fair Test: Variables for Beginners”, 2016). This experiment had several control variables that had to be kept constant, variables such as: the temperature of room; the type of seed; the amount of solution used; time of day watered; vessel that carries the seed; how seeds are placed; amount of seeds placed in each petri-dish; and the light reaching plants. The external environment was kept constant as the experiment was conducted indoors with the air conditioner set to 22Â°C and the seeds were placed in the same place on a window sill. Also, the type of seed was kept the same as radish seeds were used. In addition, vessel that carried the seeds, amount of seeds in each petri dish and how seeds were placed were all kept constant as four seeds were placed in four cotton balls in each petri dish. However, the amount of solution was not kept constant each day, as 15mL was used to water the seeds on day 1, but on the second and third days 5mL was used, and no watering took place on days 4 and 5. To improve this, the original 15mL of water should be used to water the seeds every day. Even though the environment was kept constant, to maximise seed germination, the investigation needed to take place inside of a greenhouse. In addition, the time of day was not kept constant, to ensure that the watering was at the same time every day, the radishes needed to be watered at around 5 o’clock every morning so that the seeds could maximise sunlight throughout the rest of the day. “Validity encompasses the entire experimental concept and establishes whether the results obtained meet all of the requirements of the scientific research method” (Shuttleworth, 2008). Possible errors in the results include: human error in reading measurements; not watering the seeds evenly; human error in remembering to water the seeds; and not using the same amount of cotton wool. The main reasons for this was the lack of time during a school day. In addition, there was no real way to measure out each cotton wool ball. Therefore, the results are valid for this experiment, but are not reliable to use for further research into radish seeds. The aim of this experiment was to find out how the salinity of water affects the optimum germination in radish seeds. The predicted outcome that the optimum temperature would be 0% was correct as this is what the experiment indicates. Per the results, it can be verified that as the concentration of salinity increased from 0%, the water moving into the seed decreased causing the rate of germination to also decrease eventually causing 0% of seeds to germinate in 4 days, at which the water moving into the seed was less than the amount of water moving out of the seed. Any increase in salinity concentration decreased the number of enzymes being activated to start breaking the seed coating due to the lack of water inside the seeds’ cells, causing the seeds to not germinate by the end of day 4. AoB Plants. (2014) (6th ed.). M. Krempels, D. (2017). GR – 1 Laboratory: Environment and Development: The Effects of Environment on Seed Germination. Laboratory Exercise, Miami. "Germination of Seeds: Research on Salinity." UKEssays.com. 11 2018. All Answers Ltd. 04 2019 <https://www.ukessays.com/essays/biology/germination-seeds-research-salinity-6616.php?vref=1>. "Germination of Seeds: Research on Salinity." All Answers Ltd. ukessays.com, November 2018. Web. 23 April 2019. <https://www.ukessays.com/essays/biology/germination-seeds-research-salinity-6616.php?vref=1>. UKEssays. November 2018. Germination of Seeds: Research on Salinity. [online]. Available from: https://www.ukessays.com/essays/biology/germination-seeds-research-salinity-6616.php?vref=1 [Accessed 23 April 2019]. UKEssays. Germination of Seeds: Research on Salinity [Internet]. November 2018. [Accessed 23 April 2019]; Available from: https://www.ukessays.com/essays/biology/germination-seeds-research-salinity-6616.php?vref=1.